Fat Biking. Here to Stay? This past weekend I had the privilege of joining a local community group in town, Fat Fockers to try my hand at Fat Biking. Since I don’t have a fat bike I looked into renting a bike. 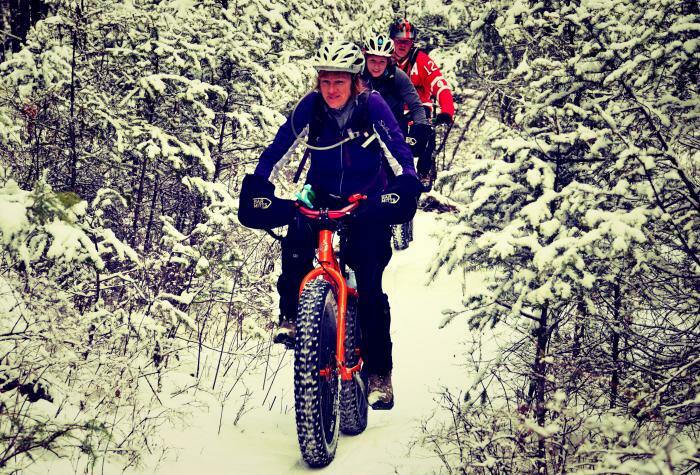 Where in Kamloops can you rent a fat bike? After a little detective work, I found District Bicycle Company. They are a new shop in town located in Valleyview. As soon as you walk in the door staff welcome you and offer a friendly, helpful attitude. The owners are Jeff and Jess Blanken, local “Kamloopsians” who want everyone, young and old to experience biking. Whether it’s climbing hills, with a smooth ride down, or sending big objectives, they are open and willing to assist you in getting set up with the right gear for the task. Jeff and Jess were more them happy to lend me a fat bike to take out on the trails. At first glance, I was unsure if I would find riding a bike with super fat tires challenging, but I quickly found out that if you know how to ride a regular bike,you would feel even more stable and secure on a fat bike. District Bicycle Company offers rentals for both fat bikes and mountain bikes. As of now, they are the only shop in Kamloops who offer a winter rental fleet. Phone the shop or check out their website for more information. Please click here for information on all of the bikes shops in Kamloops and what they offer. 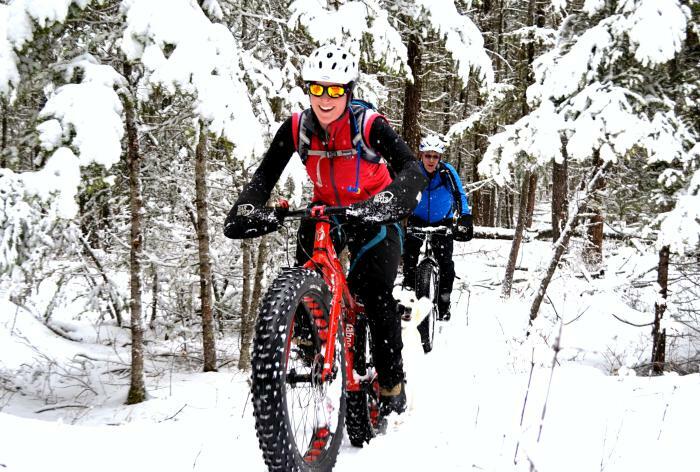 So what is Fat Biking? Wide rims, extra-large tires, and weirdly-dimensioned frames make it all fit together to define a fat bike, a cycling subcategory that’s garnered a serious following. What is the appeal? From improved traction on dirt to flotation when riding through snow, the obese tires let a bike roll where it has not rolled before. The wide rubber, fatty tires are 4+ inches across, or twice as wide as most mountain-bike tire tread adds notable grip on the ground, and the extra surface area does not allow the wheel to sink as much into soft surfaces like snow or sand. Kamloops has several amazing fat bike trails to ride, Isobel Lake, the premiere location, is the Focker groups’ playground consisting of an amazing trail system built from willing volunteers, who sweat out the trails using manpower, snowshoes, and a weighted sled converted from old skis. It is then dragged behind to help smooth out the trails. New for the Focker group, with recent grant assistance, they have been able to purchase a grooming tool which will allow trails to expand to double the existing trail network, Needless to say, the majority of grooming consists of lots of hard work and volunteers heading out on snowshoes. On a cool, crisp, Saturday I went out riding alongside the Focker group, a local community group with membership consisting of younger children and more a mature age range. I’m careful here, not to put an age label on anyone as all of the “mature” members could outride any strong downhill expert. Our ride started at the upper parking lot of Kenna Cartwright trail system. Since I am new to Kamloops, I had yet to experience Kenna, but all I can is wow! What an awesome trail network. Despite having to pedal a few hills in the snow, I was able to keep up with the Focker group and had a fabulous time. It is easy to see how one can get hooked! With membership swelling to over 90 members it is easy to see that fat biking is indeed here to stay. Thanks to everyone in the Focker group for having me along, and big thanks to District Bicycle Company shop for hooking me up with a bike to ride!